There’s a lot of buzz about the potential for virtual desktops, particularly as a way to efficiently manage users, operating systems, and applications in computer labs and call centers, where one type of desktop can often fit all. Yet, few organizations have full-scale deployments underway for knowledge workers due to challenges such as high storage costs, management complexity, and persistent personalization. 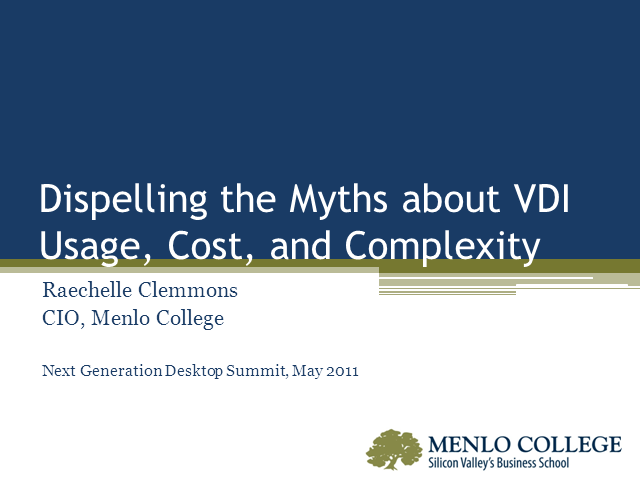 In this webinar, Raechelle Clemmons, CIO at Menlo College, will discuss her Virtual Desktop Infrastructure (VDI) project and how her team is using the latest desktop virtualization technologies from VMware and Unidesk to give students greater access to lab applications, allow faculty and staff to have fully customizable desktops, reduce the operational expenses required for desktop patching/provisioning, and minimize the capital expenses required to implement VDI.